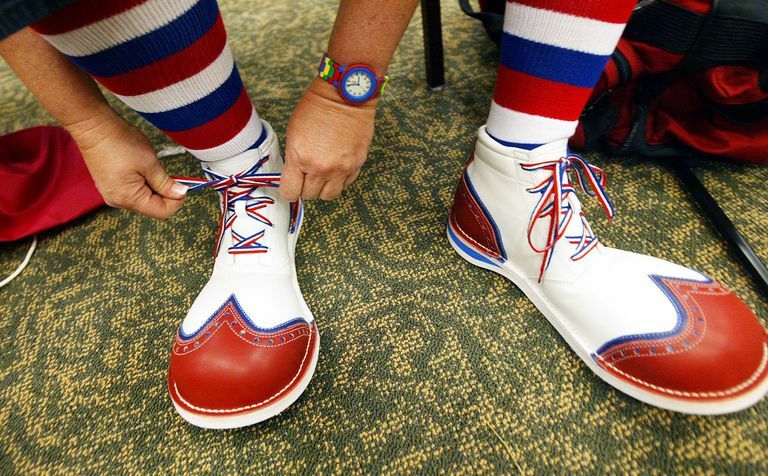 'Clownshoes' or 'clown shoes' is a form of mockery. Clownshoes means that something or someone is laughable or absurd, and not to be taken seriously. The expression comes from the preposterous costume shoes. (Svend) What the hell kind of movie is this? (Andy) You said you liked science fiction! (Svend) Dude, this movie is total clownshoes. This is the lamest acting and the cheesiest special effects ever. (Andy) Ok, do you have another suggestion? (Svend) Yeah, call Kari and Tuan and let's just go for Paintnite at the pub. Much better than this crappy movie. (first user) And furthermore, there is no scientific proof that texting while driving actually contributes to car collisions. The only thing we've proven is that cell phones are now blamed more for the same number of accidents on the road. (second user) Are you actually trying to defend texting while driving? (first user) I'm saying that the evidence proves that car crashes have not increased since cell phones came into the scene. (second user) Your argument is complete clownshoes, and you need to have your head examined. You probably think the world is flat, too. This meeting is clown shoes. Why the heck do they invite us to these things when we should be doing our jobs instead? The cop who gave me a ticket was a total clown shoe. He said I was doing 5 mph over the speed limit, which he 'estimated' by watching me. The guy who started this thread is clownshoes. I can't believe you people are buying this crap. Dude, you've gone total clown shoes. Do yourself a favor and stop drinking before you completely embarrass yourself. What a waste of time. The store manager was total clownshoes about my complaint. Let's go. This mobile app is total clownshoes. It doesn't even sync when you press the sync button. Don't install this piece of crap! The clownshoes expression, like many cultural curiosities and memes of the Internet, is a part of modern English communication. Read more Internet abbreviations and shorthand expressions.